A most creative Robyn Hood Black is our host today for Poetry Friday. Check all the posts here for this first Friday of Poetry Month! I like writing from the Word of the Month at David Harrison's blog. I thought I'd share today what I wrote for March's word, snake. This particular word brought numerous poems and much conversation. I've started a writer's support group with colleagues at school and they gave me feedback for the poem, too, but the word snake again brought up all kinds of responses from the group. Interesting how one word can be so charged emotionally. If you're interested, search the site to find the Word of the Month and you'll find the link. The word for April is fragrance. My mother shuddered when hearing “snake”. was a large black snake. I visited Aunt Barb’s farm every summer. soap, and tiny quilt stitches. after the cows were milked. I can’t think why we thought it was a good place. But we chose the outhouse. about some cute boy in town. A shadow dipped down between our heads. There are good snakes you know. He won’t hurt you at all. that others held different opinions. to look for water moccasins. but she told us they were the ones to fear. To the right of this page lists the writers for Irene Latham's progressive poem during the month at Live Your Poem.You can read the lively and interesting poem that was created last year here. Finally, you’d like to see more of the spectacular happenings occurring in April, check out Jama Rattigan’s blog, Jama’s Alphabet Soup. I think she’ll be adding to the list as she finds out more, so keep checking in. And here are a few more wonderful poetry links at Tabatha Yeatts' blog, The Opposite of Indifference. A story worth sharing, Linda! When you said, "A shadow dipped down between our heads," I could just imagine the screams! "Aware, but not scared" sounds like a good motto. Thanks Tabatha. It is really such a vivid memory! Growing up in Missouri, it was important to "know", but I really did realize I didn't have to freak out! Thanks Sheri. Thank you for sharing this wonderful poem/story - felt like I was right there. Happy Poetry Month! What a connection, Robyn! When I lived in Missouri in my adult life we had to watch often for the copperheads. They are there in moister climates. Thank you! Oh, I'm sorry, but even a very polite snake dipping down between me and another person in a fairly dark room - or even a lit one for that matter - is not going to thrill me! 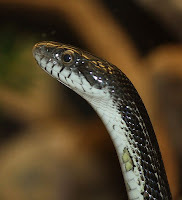 But it was a good lesson that was carried through with on the good and the bad of snakes (relative to humans that is). I know there are many who are scared, & they're not anything I want to be a pet, but it's just interesting to me how they carry such a bad rap, with nearly everyone. That's why the story came to me I suppose, really learning. I agree with Robyn: I felt like I was right there, too. Great story poem--kids will love this (and learn from it). What a fantastic aunt! In the library of my mind, she's sipping a ginger ale right now with Richard Peck's Grandma Dowdel. Thank you Janet. That aunt knew how to do so many, many things. I look back & wish I had learned even more from her. How nice of you to compare with Richard Peck's Grandma. Gives me ideas! What a great story poem, Linda. When we first moved into our current home 14 years ago, a neighbor said there was a black snake named Oscar in the woods. Don't know whether it was actually him, but once while driving along our driveway, I stopped the car to clear a stick that was blocking the way. When I reached down to grab it, it slithered away! Oh my, Jama, another snake named Oscar. I knew we had several things in common, but snakes! I bet you were quite startled! Thanks for the story! I love it that you learned a different perspective on snakes. Snakes are our friends! I actually looked up more about these rat snakes & there is one article that makes great suggestions to farmers for good habitat to encourage the snakes in order to keep the rodent population controlled, just like my aunt said! Thank you, Ruth. Love how you combined a story with poem. Loved hearing about your early life and the story of the snake and your aunt. Thanks Beverley. Sometime I would love to write and illustrate with some of those collage ideas I'm learning from you! What is it about snakes that scares us so? They always startle and slither! Copperheads, rattlesnakes, and water moccasins - all woven into my experiences growing up. Glad I'm away from my OK roots and the abundant snakes there. We don't have so many in the NW. We have very few snakes in the mountains, but here on the prairie, must watch out for rattlers. Thanks, Ramona. Perfect advice, when it comes to snakes! Snakes! You are much braver than I. I had to laugh at snake adventures and smile at your wise aunt. Aunt Barb's house sounds like the perfect place to spend the summer. You're description in the second stanza made me feel like I was there. What a fun memory! Thanks Cathy. She was a dear aunt, who did so much for all of us, never minding all the chores, we went on adventures all over the farm. My grandmother didn't have indoor plumbing until I was 12. This was my greatest fear of that odoriferous dwelling, some slimy snake biting my rear! Fun poem. Yes, we learned a lot of things,didn't we? I've been on trips with students where my knowledge came in handy! Thanks! What a great memory poem, Linda! I think I would have been as skittish as you were over that snake. Thanks Violet. It's cemented in my mind!